Makes a great country accent. 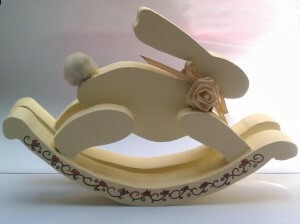 Paint the rabbit in various colors for more decorative combinations. This listing is for a digital product and no physical item will be sent. Upon receipt of payment a PDF file will be mailed to the email address provided. The file contains all instructions, material list and color photo. This project is great for a beginner project as well as the advanced crafter. This pattern is for your personal enjoyment only. You may not re-sell and make copies of this e-pattern. Sale of this pattern does not transfer rights of ownership to the buyer. Copyright 2015.